Dr. Farhad Rikhtegar joined the Interface Group at the Institute of Physiology of the University of Zurich as a visiting scholar. 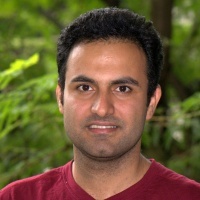 His main research interest is in the computational modeling of flow and mass transfer in physiological systems. He was previously a post-doctoral researcher for a short time in the Institute of surgical Technology and Biomechanics (ISTB) at university of Bern, under the guidance of Prof. Dr. Philippe Büchler, working on computational modeling of mechanical interaction between cancerous tumors and healthy tissue. Before, he was a research & teaching assistant at the Laboratory of Thermodynamics in Emerging Technologies at ETH Zurich, where he completed his Ph.D under the supervision of Prof. Dr. Dimos Poulikakos. His doctoral research dealt with the modeling of blood flow and drug transport in stented coronary arteries. He completed his masters and bachelors degrees, both in aerospace engineering, at Sharif University of Technology and Amirkabir University of Technology in Tehran, respectively. He is now a postdoctoral fellow at the came to Edelman Lab of the Harvard-MIT Biomedical Engineering Center. His work in the Edelman lab makes use of multi-scale modeling, in vitro tests and in vivo experiments to better understand the mechanisms involved in vascular response to therapeutic interventions. Margaret N Holme, Georg Schulz, Hans Deyhle, Timm Weitkamp, Felix Beckmann, Johannes A Lobrinus, Farhad Rikhtegar, Vartan Kurtcuoglu, Till Saxer, Bert Müller, Complementary X-ray tomography techniques: Histology-validated three-dimensional imaging of soft and hard human tissues, Nature protocols 9, 1401–1415 (2014). Farhad Rikhtegar, Christophe Wyss, Kathryn S. Stok, Dimos Poulikakos, Ralph Müller, Vartan Kurtcuoglu, Hemodynamics in coronary arteries with overlapping stents, Journal of Biomechanics, Volume 47, Issue 2, Pages 505–511 (2014). Rikhtegar F, Pacheco F, Wyss C, Stok KS, Ge H, et al. Compound Ex Vivo and In Silico Method for Hemodynamic Analysis of Stented Arteries. PLoS One 8(3): e58147 (2013). F. Rikhtegar, J.A. Knight, U. Olgac, S.C. Saur, D. Poulikakos, W. Marshall, P.C. Cattin, H. Alkadhi, V. Kurtcuoglu. Choosing the optimal wall shear parameter for the prediction of plaque location — A patient-specific computational study in human left coronary arteries. Atherosclerosis 221, 432-437 (2012). Marzia Buscema, Margaret N Holme, Farhad Rikhtegar, Vartan Kurtcuoglu, Andreas Weinberger, Simon Bugna, Julia Herzen, Felix Beckmann, Irene Zanette, Timm Weitkamp, Raphael Urbani, Thomas Pfohl, Andreas Zumbuehl, Till Saxer and Bert Mϋller, Determining the Shear Stress Threshold of Mechano-Sensitive Nano-Containers for Targeted Vasodilatation, 4th Japan-Switzerland Workshop on Biomechanics (JSB2014), Nagoya, JAPAN. Farhad Rikhtegar, Fernando Pacheco, Christophe Wyss, Kathryn S. Stok, Heng Ge, Ryan J. Choo, Aldo Ferrari, Dimos Poulikakos, Ralph Müller, Vartan Kurtcuoglu, From Real Heart to CFD, Compound ex vivo and in silico method to study stented arteries, 8th international symposium on Biomechanics in Vascular Biology and Cardiovascular Disease, Rotterdam (2013). F. Rikhtegar, J.A. Knight, U. Olgac, S.C. Saur, D. Poulikakos, W. Marshall, P.C. Cattin, H. Alkadhi, V. Kurtcuoglu. Optimal wall shear parameter for the prediction of plaque location, A patient-specific computational study in human left coronary arteries. 8th international symposium on Biomechanics in Vascular Biology and Cardiovascular Disease, Rotterdam (2013).